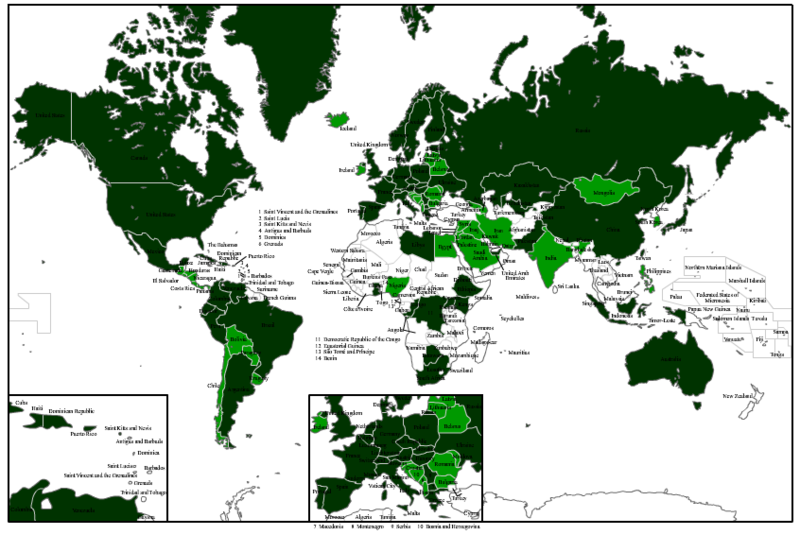 In the enclosed map of the world, the countries highlighted in Lazarite Green refer to countries and jurisdictions wherein the United Grand Priories is represented by means of a Grand Priory, Grand Commandery, Commandery or Delegation of the Hospitaller Order of Saint Lazarus of Jerusalem. In some of these countries, the Grand Priories of the Order are presently 'in formation', meaning that the Lazarite delegations and Commanderies in the region in question will be formally upgraded and consecrated into Grand Priories by decree of the Supreme Grand Priory of the Order. The countries highlighted in Light Green refer to countries and jurisdictions wherein the United Grand Priories of the Order is represented by means of its sister affiliated organizations such as the Sacred Medical Order of the Knights of Hope. These chivalric organizations operate in countries as diverse as Bolivia, Egypt, India, Ireland, Mongolia, Nepal, New Zealand and Venezuela. As of January 2016, the United Grand Priories is physically present in 72 consecrated and registered jurisdictions in 63 countries. Additionally, its sister affiliated organizations are also present by means of representatives in a further 19 countries. Truly an international confraternity of Lazarites! 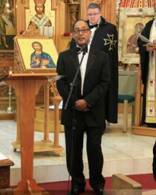 The United Grand Priories of the Hospitaller Order of Saint Lazarus of Jerusalem is led by its democratically elected Supreme Grand Prior, H. E. Richard Comyns of Ludston GCLJ GCMLJ. 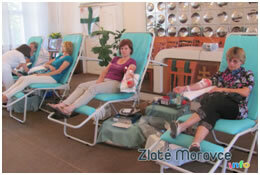 The Supreme Grand Priory is constitutionally elected at the International Lazarite Congresses every five years. The Supreme Grand Prior then appoints his Grand Officers worldwide. These form the Knights in Council within the Supreme Grand Priory. The Order of Saint Lazarus is very active worldwide with various dynastic and noble families within its ranks. A number of Grand Priories of the Order are run by such personalities, including the President of the Ethiopian Crown Council, His Imperial Highness Prince Ermias Sahle-Selassie Haile-Selassie, the grandson of Emperor Haile-Selassie, who is the Grand Prior of our Ethiopian Grand Priory (photo far left); the Vice Chairman of the Council of Timorese Rajas (Dewan Usif Timor) and Head of the Royal House of Kupang, His Royal Highness the Raja Don Leopold Nicolaas Isu Nisnoni (middle photo), who is the Grand Prior of our Indonesian Grand Priory; His Majesty the late King Kigeli V of Rwanda (photo far right) who was appointed Grand Prior of the Grand Priory of Rwanda in April 2016 and many others. The United Grand Priories of the Hospitaller Order of Saint Lazarus of Jerusalem, apart from the mentioned international chivalric and Hospitaller organizations which are its members, operate in six continents, within 63 different countries and 72 different jurisdictions all under the Supreme Grand Priory of the Order. 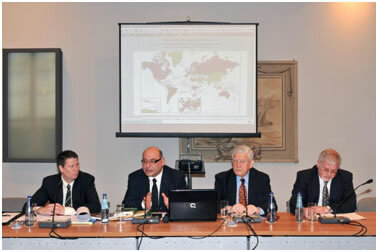 Grand Officers of the United Grand Priories of the Hospitaller Order of Saint Lazarus of Jerusalem in the April 2012 International Lazarite Symposium discussing the operations of the various jurisdictions of the Order around the world. 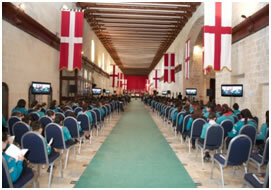 These international initiatives create the largest Lazarite platform worldwide for members of the Order from all the parts of the globe to congregate and discuss the challenges of 21st century Hospitaller work. The 2014 International Lazarite Symposium was held in Saint Kitts and Nevis Island in June 2014, and the 2016 International Lazarite Symposium was organized in Florida (January) and Malta (April/May). In June 2017, the International Lazarite Symposium will be held again in Saint Kitts and Nevis Island. Various instances during the International Lazarite Congresses held since 2012.
within the United Nations Organisation and also within the European Commission and various bodies operating under the Council of Europe. 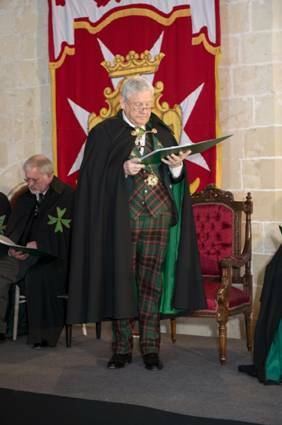 The United Grand Priories of the Hospitaller Order of Saint Lazarus of Jerusalem was established in 1995 as a chivalric organization emulating the noble ideals of the medieval but extinct Order of Saint Lazarus. In that year, the Grand Priories of England and Scotland combined to create this new Lazarite organization. 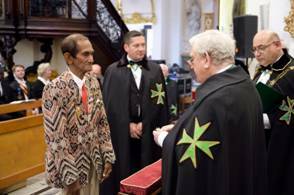 Today, the Hospitaller Order of Saint Lazarus continues its Hospitaller and philanthropic work in 72 different jurisdictions around the world and is spread in six continents. There are other regions which include members of the Order but who are not yet numerous enough to create their own Commanderies, Grand Commanderies, Priories or Grand Priories. All these, together with the respective regional Delegations listed hereunder, form part of the Grand Priory of the International Lazarites and are duly represented in the Supreme Grand Priory of the Order by means of the former Grand Priory representatives. The Sacred Medical Order of the Knights of Hope with its own autonomous structure is also fully represented in the Supreme Grand Priory of the Order . Other chivalric organisations and institutions have special memoranda of understanding with the Order so as to ensure more synergy worldwide when executing Hospitaller and philanthropic initiatives. Click on the chapter ‘The Grand Priories’ to know more about the operations in the various regions of Lazarite activities.